So, Harold Miner's overall play certainly never lived up to the "Baby Jordan" nickname but his dunks were still quite dope. 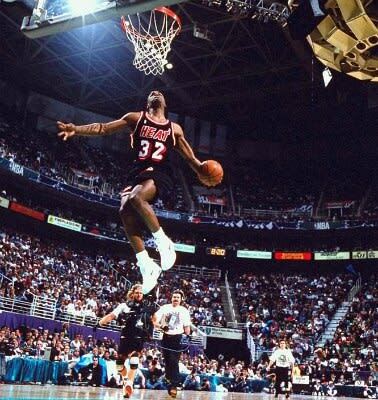 He won the Slam Dunk Contest in 1993 and 1995. Sadly, those were the only highlights of Miner's career which included just 47 starts over four seasons. Considering the most recent "Baby Jordan" reference came via a diss from Wale, we're glad to give "Baby Jordan" a bit of contemporary shine.